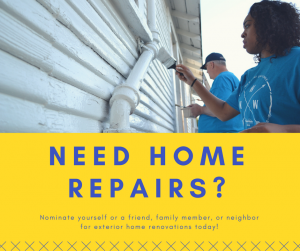 From time to time, NeighborWorks Waco has opportunities to provide volunteers to perform exterior renovations for neighborhood homes. NeighborWorks Waco is often contacted by local organizations for opportunities for volunteers to give back to the community. We are searching for neighbors that could benefit from this assistance. You are welcome to nominate yourself or a friend, family member, or neighbor. My nominee is experiencing some degree of need (elderly, disabled, low-income, etc.). My nominee owns the home needing repair. My nominee is not currently renting the property. The repairs needing to be done are located on the exterior of the home. Repairs CANNOT include roofing or other repairs requiring a professional. The home needing repairs is located within the City of Waco (please note - preference may be given to those homes in the East Waco area). Please contact NeighborWorks Waco at 254-752-1647 if you have questions regarding the location of the home. If the above are true, please complete the application below to submit your nomination!